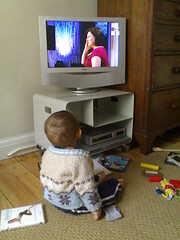 I really like watching any programme with people on it. Papa gets very annoyed and says that TV makes you stupid and I should not be watching it. But then he cannot be bothered to get up and play with me, so what am I supposed to do? Thank God, Papa will go back to work next week. Mummy is away on a trip and Oma Marianne is here to visit. So it is all very exciting. Oh, and I have learned to crawl. Papa thinks it's a big deal and is very excited. I don't think it's that great. I crawled into the kitchen yesterday, but there wasn't really that much there, so I am not going there again. I will stick with the telly for now.